Inside each of us there is an island dream. It is cast in quiet images of sunny, unspoiled beaches, caressed by crystal waters and deep blue skies. Vivid green is the color of its tropical landscape and scenic blue is the color of its fragrant refreshing air. Ahhh, the adventures it invites us to find ... if only the dream were real. Dreams CAN come true: in beautiful Kosrae, pleasure calls in the smiles of its gracious people, in the lure of its sea for fishing and play, and most of all in its restful, scenic way of life. Rich in historical sites and ruins, this jewel of Micronesia was a favorite haven of pirate Bully Hayes. Pirate or not, you'll find adventures aplenty in spectacular Kosrae. 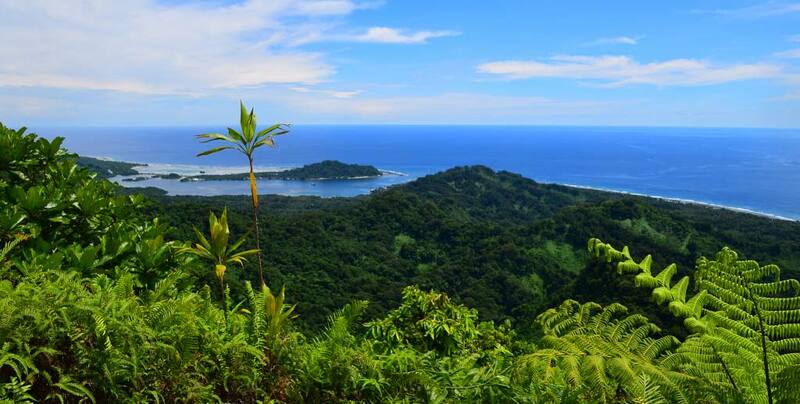 "We believe you'll find Kosrae one of the friendliest, most picturesque islands in the world. If you think we're dreaming, please don't wake us!" At Kosrae Nautilus Resort our intimate 18-room grounds are located in tropical gardens, staffed by friendly faces ready to attend to your every comfort. Rest easy in our air-conditioned rooms, all with two double beds, 26-channel cable TV, minibar, and tea/coffee making facilities with daily room service to boot. Venture out from your room into our full restaurant and bar, and take a dip in our swimming pool. At Nautilus, we aim to please: and your pleasure is our uncompromising goal. © Copyright 2000 - 2019 Kosrae Nautilus Join Our Mailing List!